NEW YORK (AP) — Opera has been popping up recently at the most unlikely New York places: a revamped garage, a dive bar, a basketball court and even an old aircraft carrier. It’s part of a festival with an in-your-face goal — to bring this once grandiose art form to ordinary places where people hang out. The New York Opera Fest 2017 that ends in late June has drawn casual, but curious, spectators, some of whom may never have gone to an expensive production in a plush theater. On Saturday, composer Darius Milhaud’s “The Guilty Mother” got its U.S. premiere in the onetime garage on Manhattan’s West Side — a story rife with adultery and intrigue. The more than 30 festival spectacles included a Brooklyn basketball court that hosted a hip-hop opera called “Bounce,” with a group of public school kids participating. Children also were invited, free of charge, to Public School 129 in Harlem for a playground performance last week of Donizetti’s “The Elixir of Love.” The kids helped create the production, from designing the costumes to singing in the chorus. Excerpts from Bizet’s “Carmen” were heard in a bar called Freddy’s in Brooklyn’s Park Slope neighborhood, under a beer-stained wall. 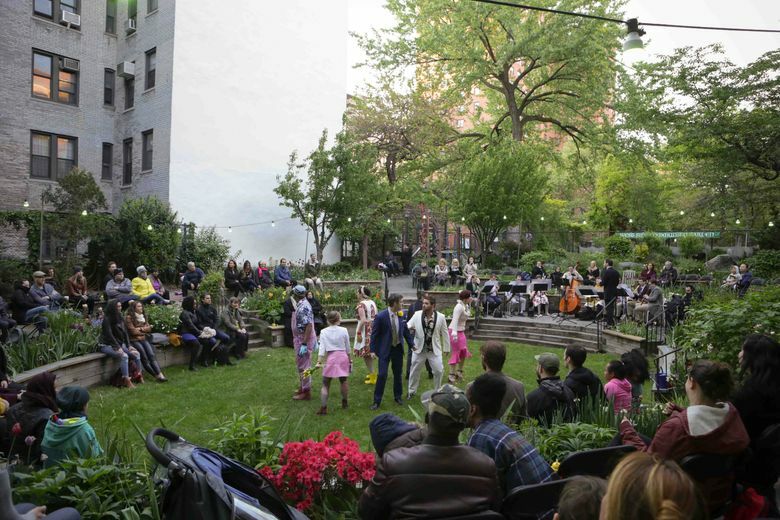 And Mozart melodies floated through a lush community garden on Manhattan’s Upper West Side for the composer’s “La Finta Giardiniera,” a free performance in which a noblewoman poses as a simple gardener while caught up in her own romantic twists and turns. In Harlem, the Baylander, a decommissioned aircraft carrier, was the stage for Tom Cipullo’s “Glory Denied,” which dives into the struggles of an American prisoner of war in Vietnam. The festival serves to counter the shrinking audiences for the formal grand opera tradition. Organizers say that experimenting with new ways of presenting it to spectators of all ages has pumped fresh blood into this still great musical theater. The festival, starting in May, brought together a group of small, innovative companies experts say are the cutting-edge future of the classical arts.